Hundreds of thousands of people are marching in London on Saturday to demand a second Brexit referendum. The demonstrators are being joined by protesters from Scotland who specifically travelled to participate in the demonstration on Parliament Square. First Minister Nicola Sturgeon is attending the London People's March during which is expected to address the public. Additionally, Scottish National Party (SNP) Westminster leader Ian Blackford will deliver a speech. Birmingham Member of Parliament Jess Phillips is another politician who is expected to give a speech at the rally for a public vote. The march has become a platform for a range of British politicians, including ex-UKIP leader Niger Farage, to voice their views and stance on Brexit. According to the politician, the people who want the withdrawal from the EU actually form 'the majority'. Amid the ongoing demonstration, London Mayor Sadiq Khan turned to Twitter where he stated that thousands of people "have come together with @peoplesvote_uk to send a clear message: Enough is enough — it's time to give the British public the final say on Brexit." He pointed out that the British people had not voted for a no-deal Brexit. "No matter how you voted, I'm sure you'll agree — #Brexit is a complete and utter mess. The British people didn't vote for a bad Brexit deal. The British people didn't vote for a no-deal Brexit. It's time to give us — the British people — the final say," Khan added. At the same time, the petition for the UK government and parliament with a demand to retain membership in the European Union has already gained over 4.3 million signatures. 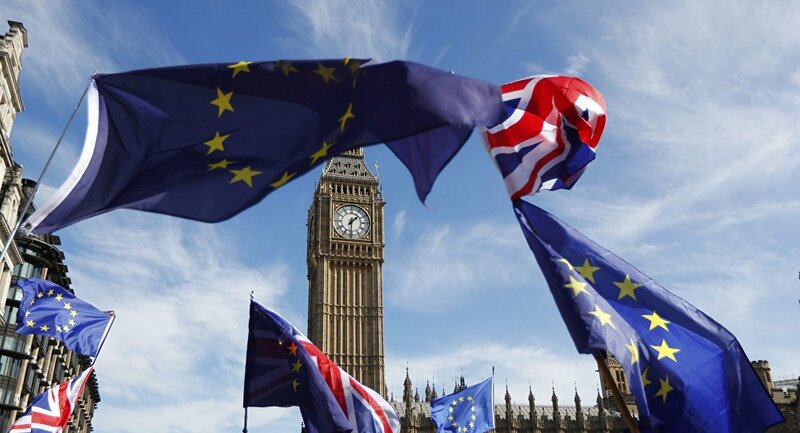 The demonstration comes at a time when the European Union has agreed to grant the United Kingdom a delay to the original departure date of 29 March. The United Kingdom has to decide until 22 May if its parliament passes the withdrawal deal next week, and until 12 April if it does not. At the same time, the European Union indicated it would not reopen negotiations on the deal agreed with the UK government. Nevertheless, the British lawmakers have already rejected the agreement twice.